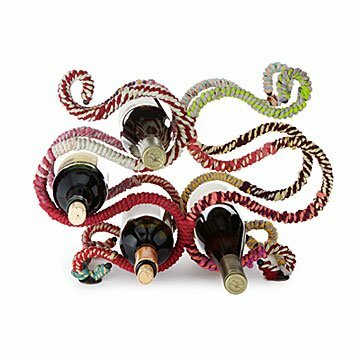 Guests will ooh and ahh over this colorful wine rack handmade from wire and wrapped in reclaimed saris. Your parties are bright and colorful—shouldn't your decor match? Cue this vibrant wine rack. Artisans in India handcraft the piece from sturdy wire, wrapping them in bits of colorful reclaimed saris. Each is unique with its own rainbow of colors and mix of patterns. It'll have guests oohing and ahhing on their way to pop another bottle. Handmade in India.